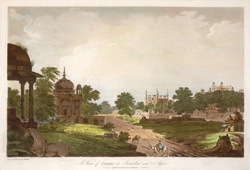 This is plate 40 from William Hodges' book 'Select Views in India'. In 1783 Hodges went to Sikandra, which is near Agra. It takes its name frin Sikander Lodi (1489-1517), one of the last kings of the Delhi Sultanante. Along the road from Delhi to Agra there are many monuments and several tombs, about which Hodges wrote: "the tradition is that these tombs were raised by Akbar for favourite women of his zenanah and placed round the monument he was raising for his own future interment. The tomb of the Emperor is seeing towering above the trees."